I think of myself as a fairly skilled home cook. I usually have the basics covered and feel comfortable with many skills and ingredients. But when it comes to potatoes, I've had almost no experience until we started getting them in our CSA boxes. It's not that I don't like potatoes; I just strongly prefer rice, bread and pasta as my grains of choice, so I always choose those first. This recipe has changed my mind, though. The crunch on these is otherworldly, and I probably don't need to tell you that the garlic and rosemary are exactly the right complements. These are our new brunch staple. 1. Place the potatoes in a pot of salted water. Bring to a boil and simmer until nearly tender, about 10 minutes. Drain well. 2. Heat the oil over medium-high heat in a 12-inch nonstick skillet for 3-4 minutes. Add the potatoes and cook, tossing and stirring occasionally (not constantly), until they are nicely browned all over, about 15 minutes. 3. Add the rosemary and garlic and continue to cook for about 5 more minutes, stirring frequently. Salt generously (and pepper to taste), remove from heat, and serve. I've found that parboiling is the secret to 90% of successful potato dishes. 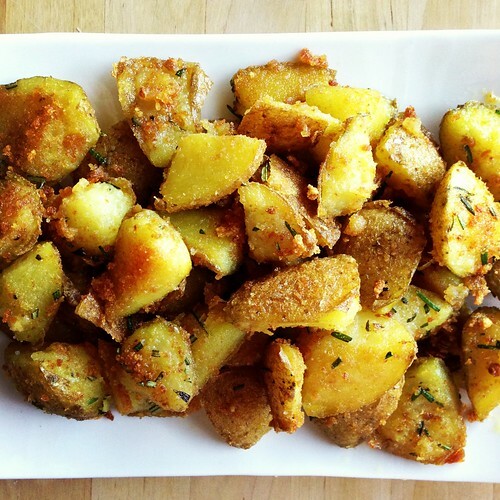 These look yummy and I have both potatoes and rosemary at home! Made these for dinner last night, very yummy! Thanks, Amy!